Krishak Mukti Sangram Samiti (KMSS) leader Akhil Gogoi is misguiding the people of Assam over Citizenship (Amendment) Bill, 2016 and creating a rift among the people of Assam. This was alleged by Dr Ganayanda Barman, prominent educationist of Assam. 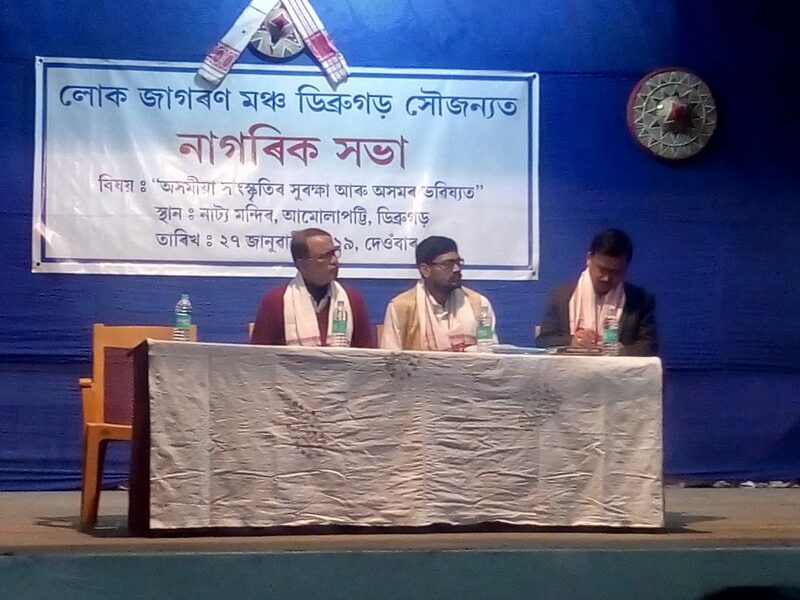 While participating in a citizens’ meet programme on Sunday organized by Lokjagran Manch of Dibrugarh at Amolapatty Natya Mandir, Barman slammed Akhil Gogoi for misguiding the people on Citizenship (Amendment) Bill. He accused Akhil Gogoi of providing wrong information to the people on the citizenship bill. “The Citizenship (Amendment) Bill 2019 will benefit the people of Assam. Due to religious persecution and facing tortures, the Hindu Bangladeshis have come to Assam and it is our duty to help them because they were forced to flee from Bangladesh after facing innumerable tortures from Bangladeshi Muslims. Their land and property were grabbed and even many Hindu women’s were brutally raped in Bangladesh,” Barman said. He said the Clause 6 of the Assam Accord will provide a constitutional, legislative and administrative safeguard to the people of Assam. “Government is going to implement the Clause 6 very soon. We welcome the decision of the government for implementation of the Clause 6,” he added. A discussion was held on Assamese culture security and Assam’s future where leading citizens of Dibrugarh and AMCH doctors participated. Bankim Sarma , an advocate of Guwahati High court said that the bill will not harm the Assamese society or its language because there is already an act called The Assam Official Language Act 1960 which will provide safeguard to the Assamese language. A member of Lokjagran manch said they have organized the citizens’ meet to clear every point of the Citizenship (Amendment) Bill, 2016 because many have a misconception about the bill because some organizations are providing wrong information about the bill. “We have organised the citizens’ meet in Diphu recently and similar meets will be organised in every district of Assam to create awareness on the bill,” said the organizer. Debokarna Phukan, principal of Demow College also participated in the citizens meet and spoke about the bill.